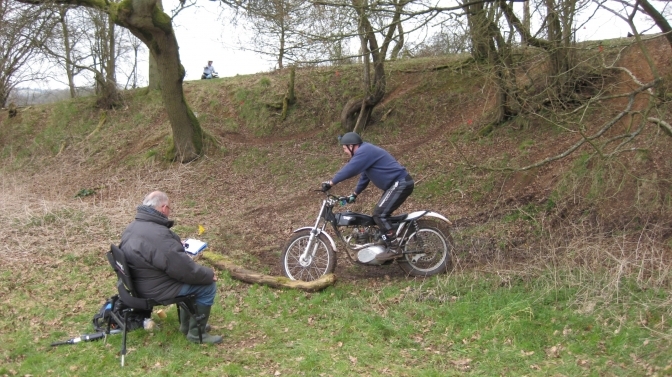 A Page set up for photographs from the BLUE route of BMCA Midlands Trials. 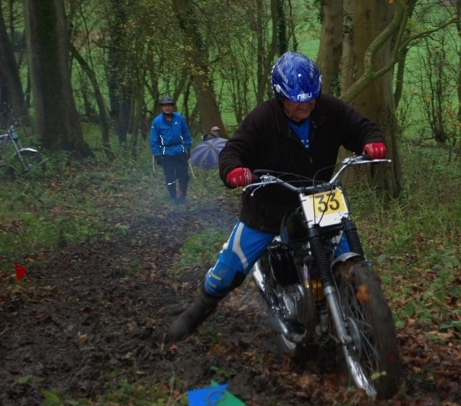 For Photos of the BLUE route at the 2016 BMCA trials. 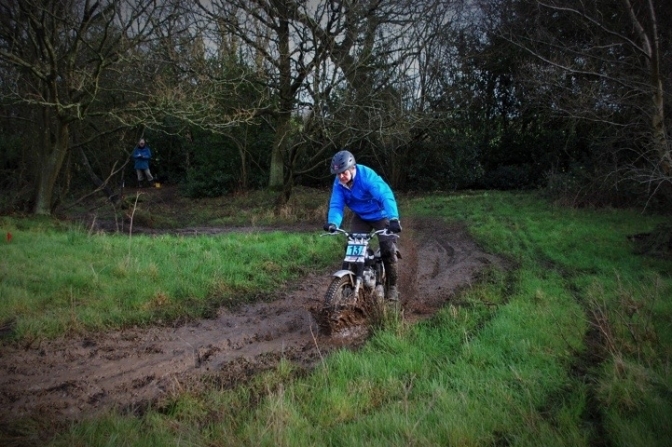 This page is for photographs sent to me from the Midlands Trials club BMCA. 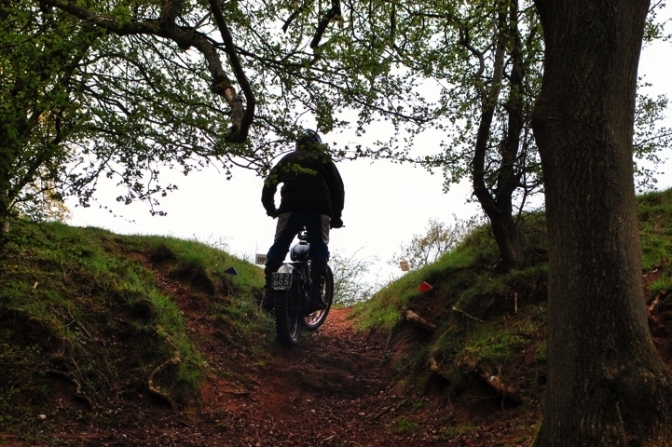 Why the Blue route well this is the sort of sections that we are trying to get back to encourage more into Classic Motorcycle Trials Riding. 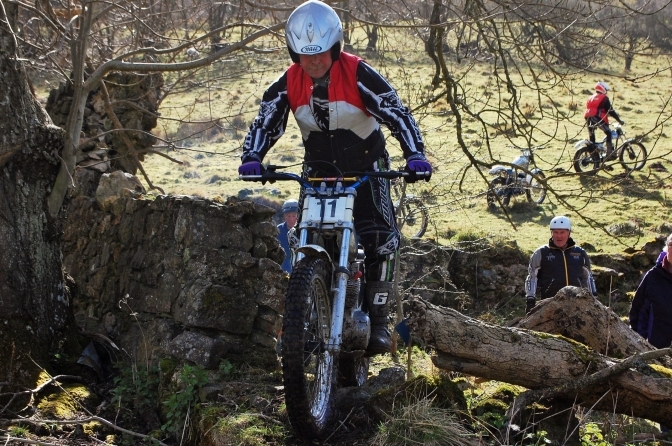 Beginners Route: All Trials shown in BLUE on the fixture list will include a Gentlemen/Beginners route - riders must enter the section through the Section Begins Cards, and exit through the Section Ends Cards, but can ride anywhere within these markers. Riders numbers will indicate the route allowed. Al Ussher sent me this. 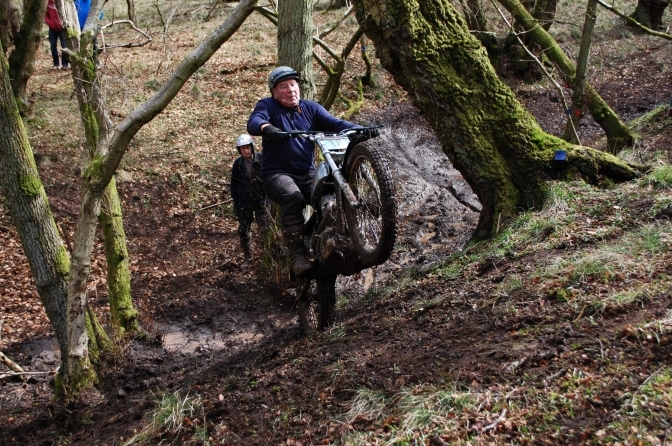 There's always grip at the bottom of Shropshire mud... so says Micky Parkes! 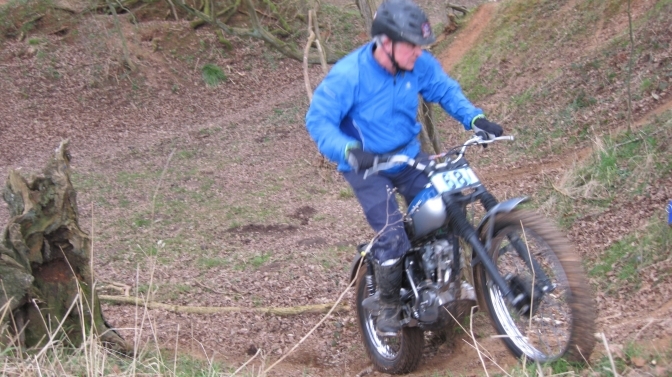 Ray Barratt has a great time on the 350 Bullet. All photos on this page are Courtesy of Al "Hammertight"and should be respected. Giles Hixon ,CoTTon. 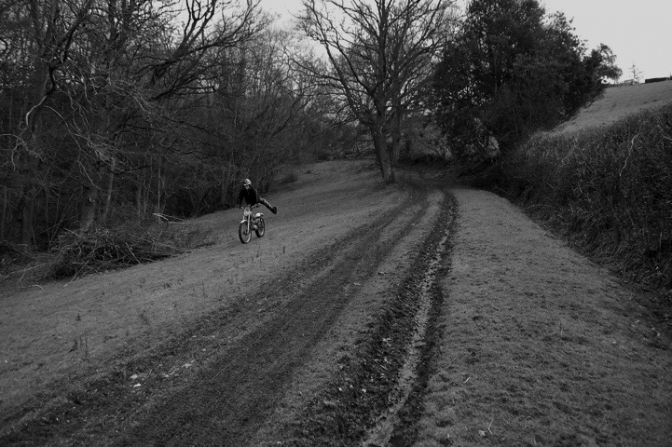 riding a Proper section. Kevin Walker, Triumph Cub, and observer Andy Lane tucked well out of harms way. 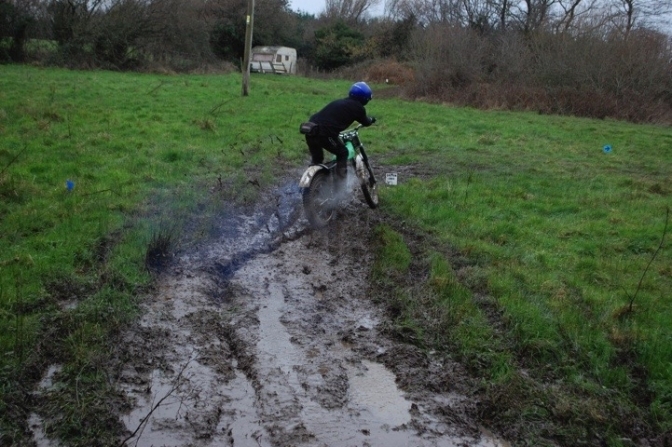 PS, don't stand behind a bike ploughing through wet MUD. And Ray Barratt Royal Enfield 350 bullet. Spells it out in Black and White. No tight turns and not a tape in sight. Easthope Wood Air Ambulance Trial. Dont forget this trial in 2018 will you. 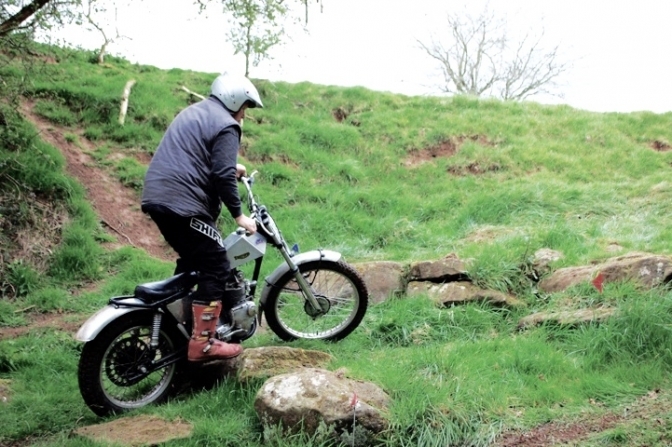 The more rigid bikes the better. Mike Butler Francis Barnett with Villiers 8E engine "All Hands on Deck"
Joe Owen Triumph number 67. 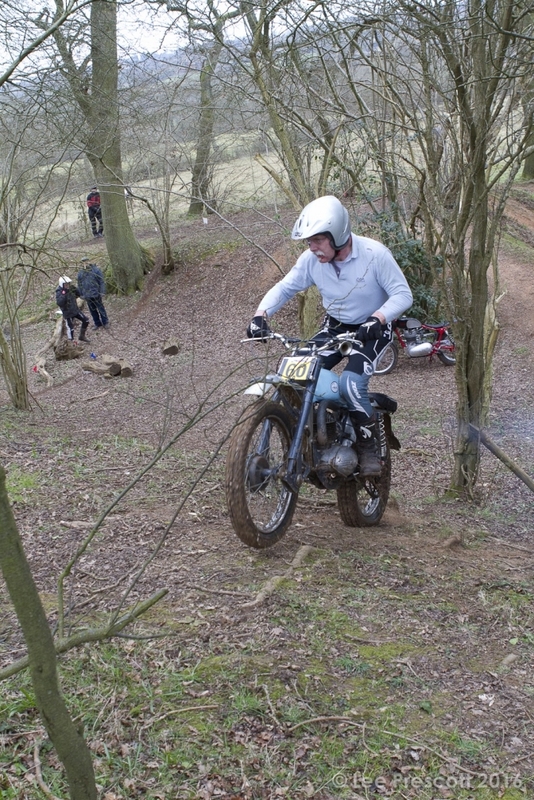 Steve Hay BSA C15 in winning form. number 26. 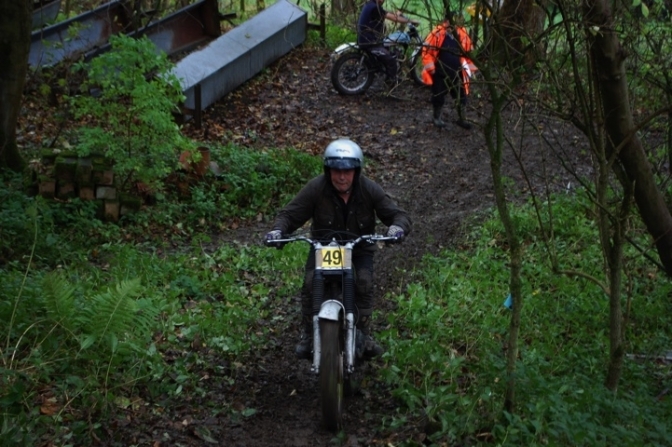 Kevin Walker Triumph Cub number 37 showing the section who is master. 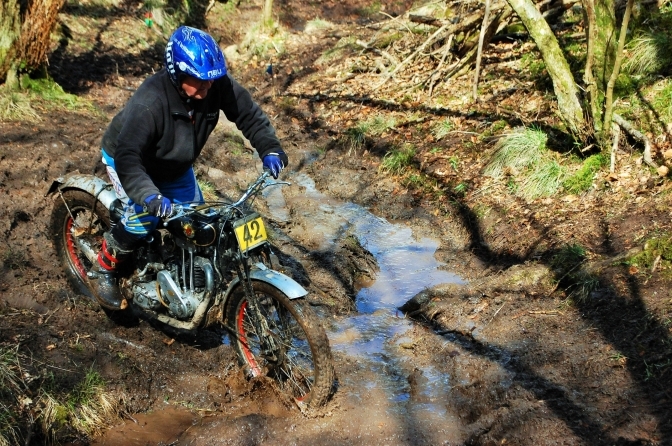 Ray Barratt 350 Royal Enfield number 7 with determination. Lui Farinaccio BSA C15 Number 41. 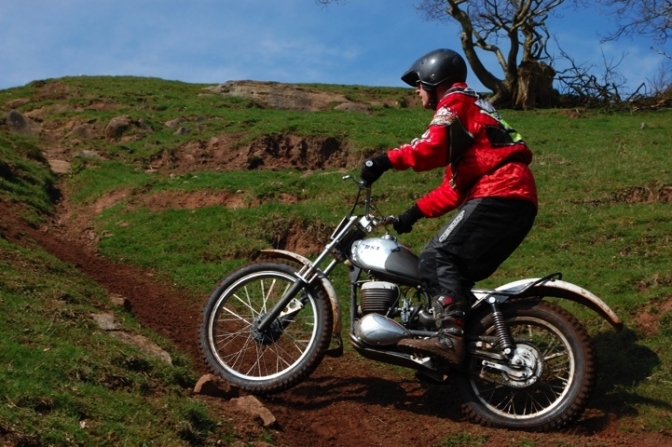 Pete Reed Triumph Twin 410 Number 28. Proper Spring like. 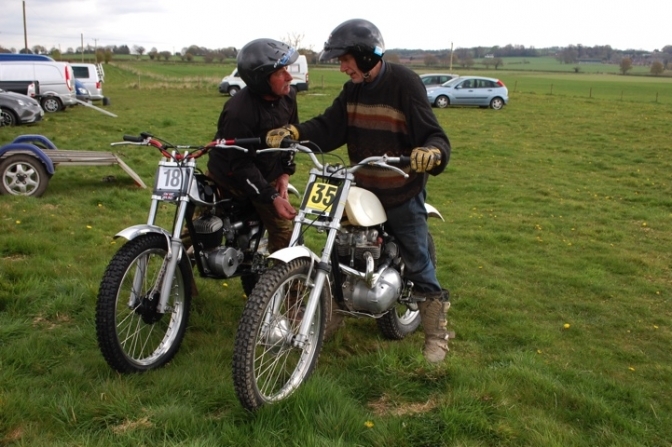 Mike Butler BSA Bantam. Number 85. Proper Pre 65 Section. 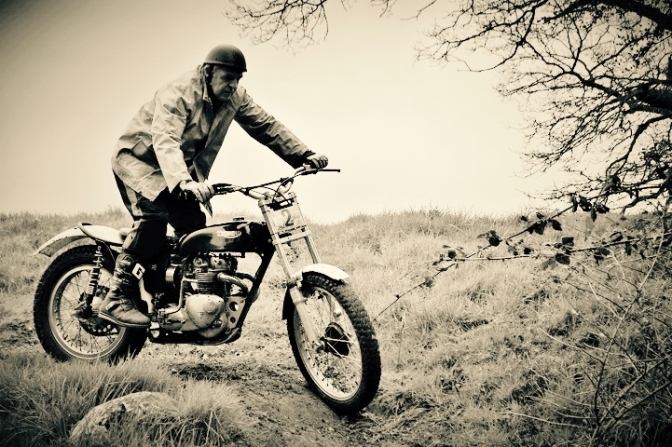 Ray Barrett Royal Enfield nuber 60. 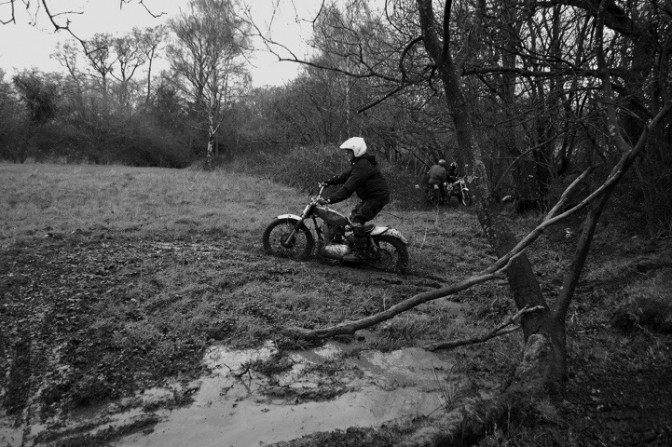 George Houghton BSA Bantam Having Fun! Photos Courtesy Al-U and Copyright. 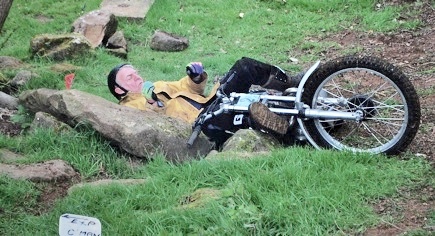 We have all been there , I hope Steve Hipkin is not watching? Now back to the "Classics". Wilderley, Edge of the Long Mynd. 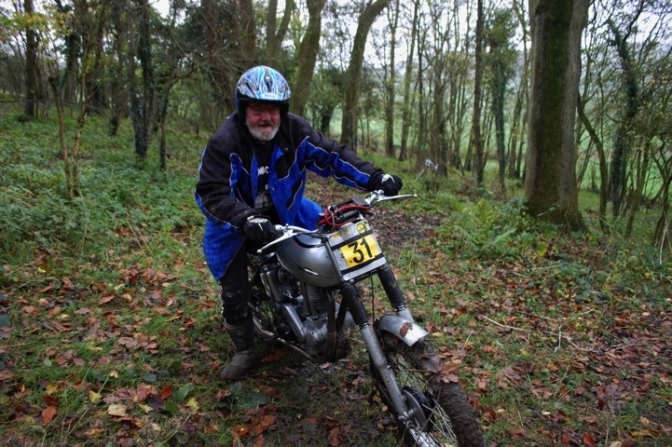 "Big" Arthur Browning number 35 Jawa. Ben Millichap number 28 BSA Bantam. 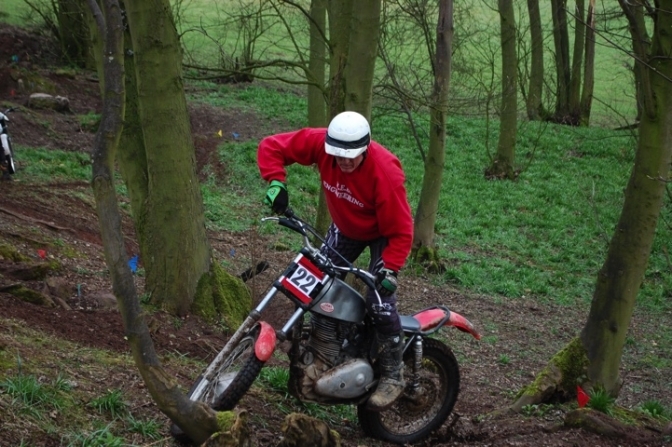 Jim Pickering "Drayton" BSA Bantam number 31 with a "Works" Dab. Christian Pearson Triumph Tiger Cub Number 24. Remember this Al ? 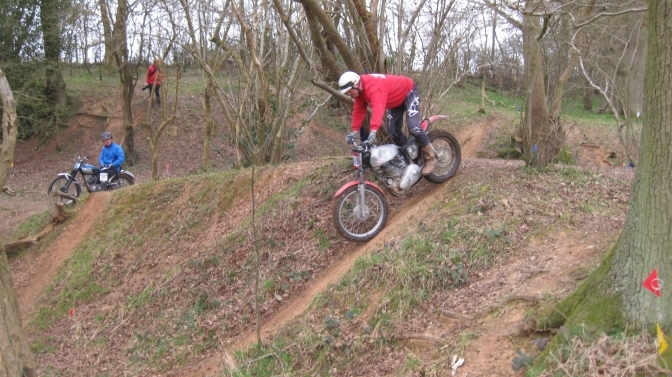 2010 Classic Trials Show. 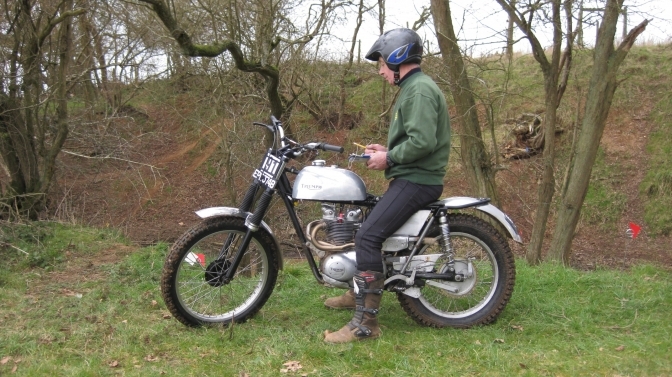 Just found it out because I am going to do a page on this bike and others with the BSA/Triumph twin Scooter engines. BMCA. 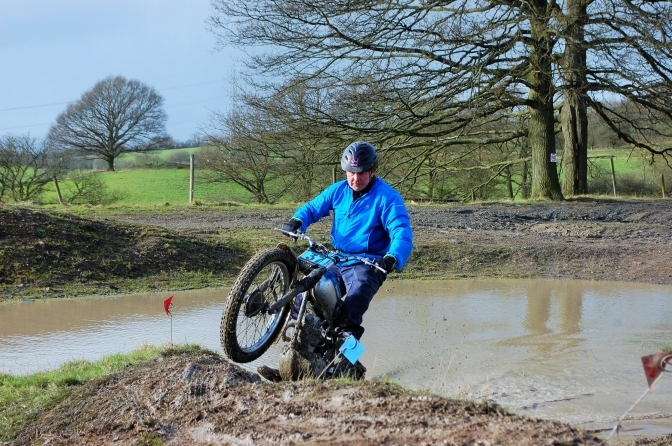 "BRITISH BIKE" Trial Tanworth-in-Arden 20/03/2016. "Ullenhall". 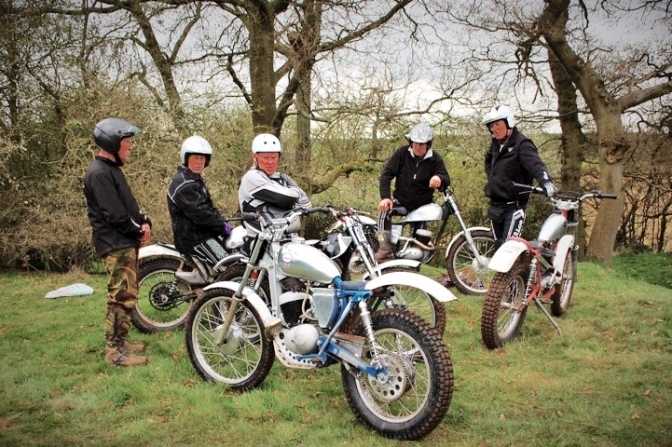 BMCA, "BRITISH BIKE" Trial at Mockley Manor Farm Tanworth-in-Arden Warwickshire. Spring was in the air, as the pockets of blue started to appear and sharp shards of golden sun started to pierce the warm muddy coloured cloud. by Midday the warmth of approaching spring was with us. 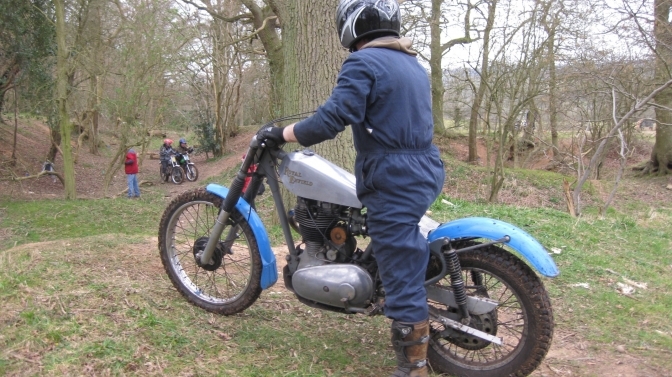 From a distance the growl that only a Triumph Twin can make was interrupted by the barking of the Royal Enfields and the crack from Arthur Brownings Jawa. The clucking of the flock of Bantams that seemed to have been breeding well over the winter months, an Hybrid species named "Drayton",I was told. 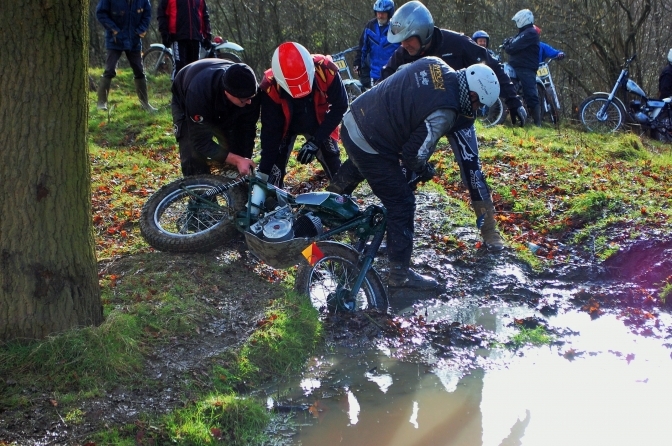 The ground drying out over the past week has made an easy job of cleaning the bikes when the chaps get home. 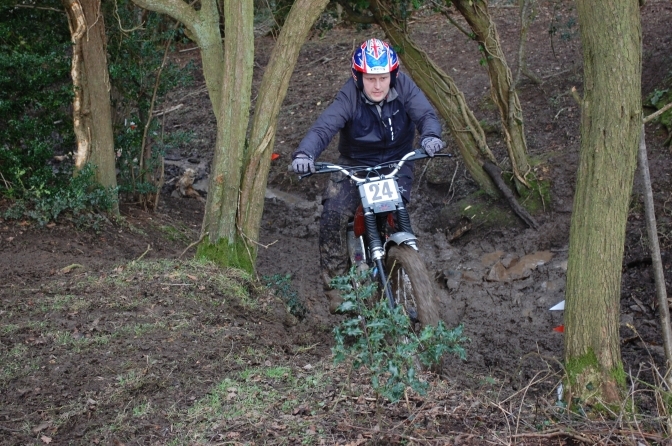 One could get caught out though as some of the underlying soil still had movement. 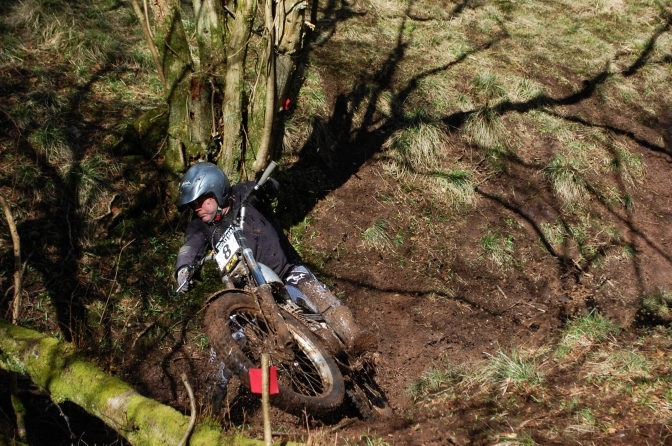 All in all you could not fault the weather, ground conditions, sections, or riders ,but there were a few tricky turns catching them out, and also the lack as is usual of a few more observers, a nice little course of sections on limited ground, and well worth getting them Brit Bikes out for. 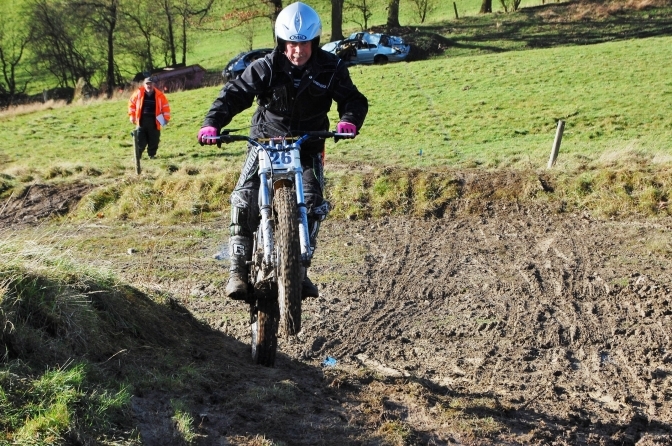 Winners were Joe Owen Tri Twin Intermediate class. 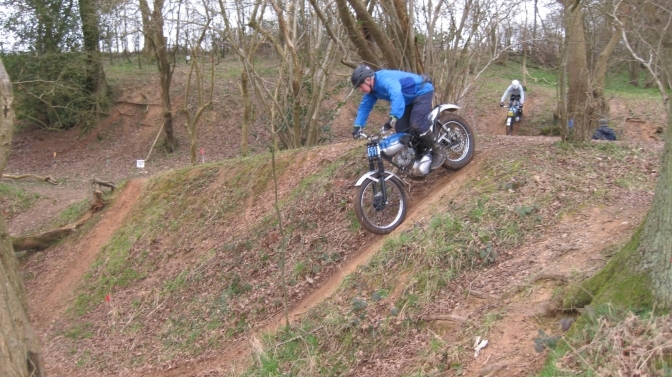 Nigel Randel BSA Bantam Expert route. and Dave Harrison Clubmans route. 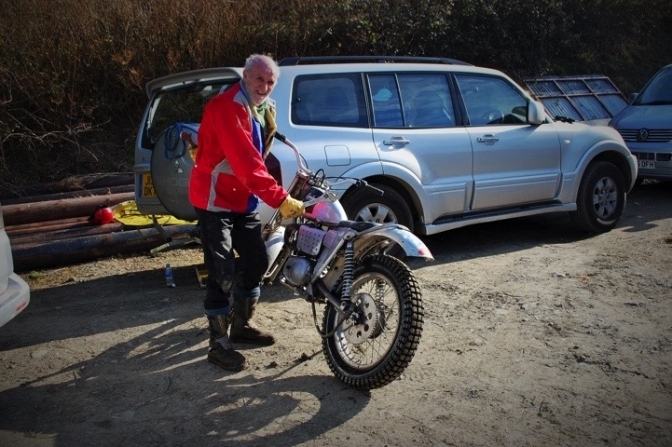 There are a couple of shots on Dave's Bike on the Drayton "BanStar" page. Arthur Browning Jawa. you can see the conditions, and the fact that on some sections the riders had to mark the card for each other. 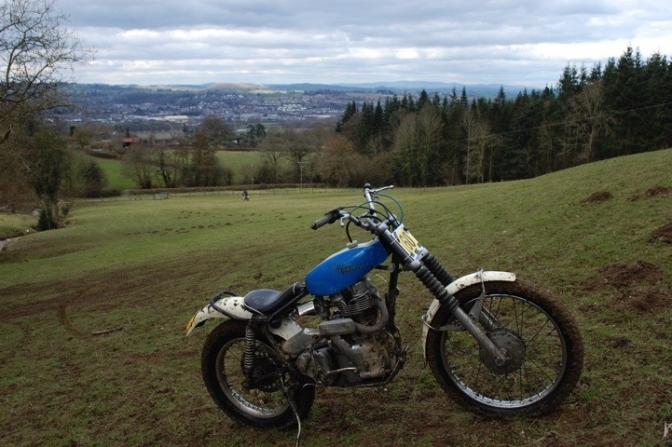 This Royal Enfield was near to is birth place at Redditch, today. I must say that it is a very popular breed with the BMCA contingent. some even from India. This bike is starting to become a "Star" on this page, and proves you don't need the bling to have a a superb British Machine that performs very well in virtualy standard trim. 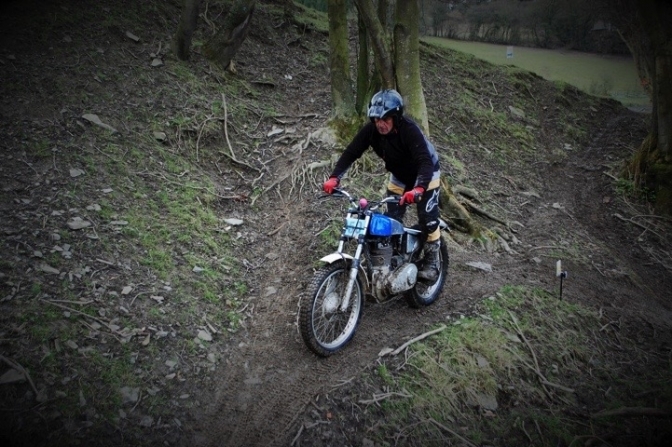 Twin Triumph, Joe Owen, Intermediate Winner. Do you know perhaps we should provide all of observers a seat for there long stays at there posts , perhaps I will design one up, like a portable Guardsman's station, but with a seat, perhaps? Looks like a rogue Cockerel got into the Drayton flock with this bike ,This is the New Hybrid Villiers Drayton cross. 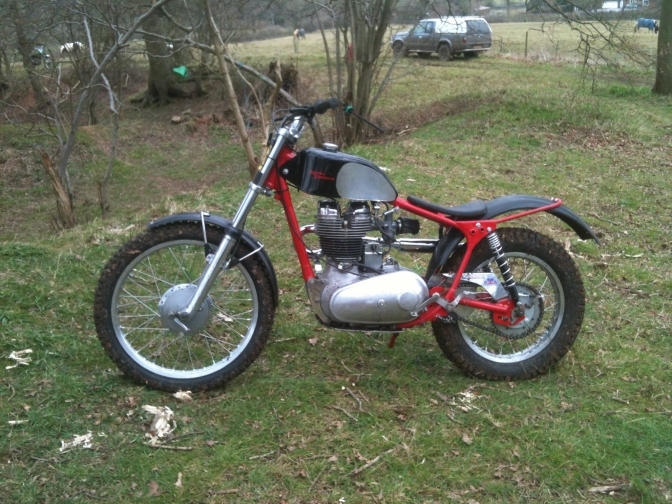 A nice little bike and looks the part for a Classic machine. The face is also familiar, Charles Millington. 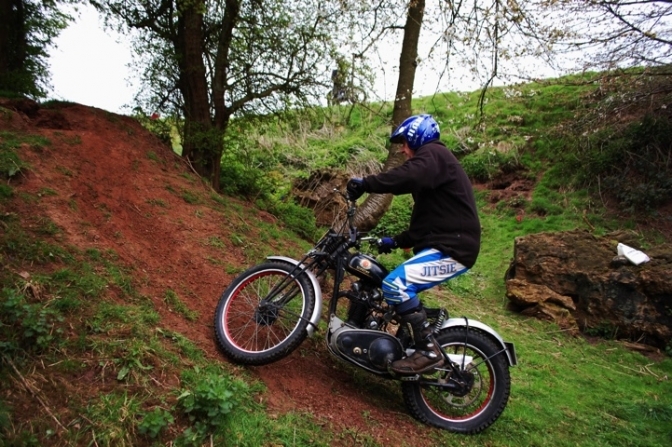 This I believe is a Indian built Enfield but has made a True British Trials Bike. 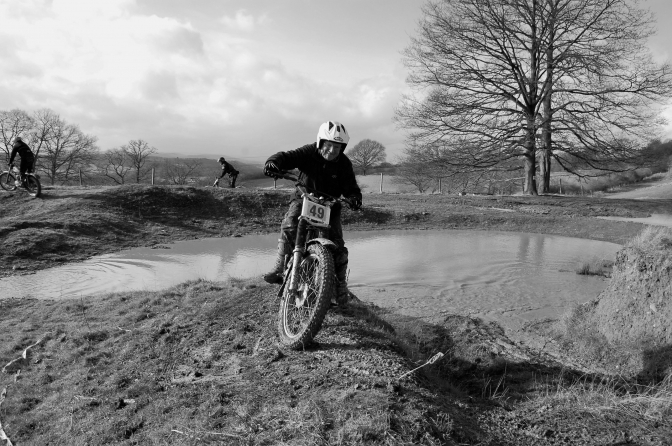 And this guy Oliver Turner was loving his ride on the machine. Photo Credit Lee Prescott. Oliver Turner Enfield. 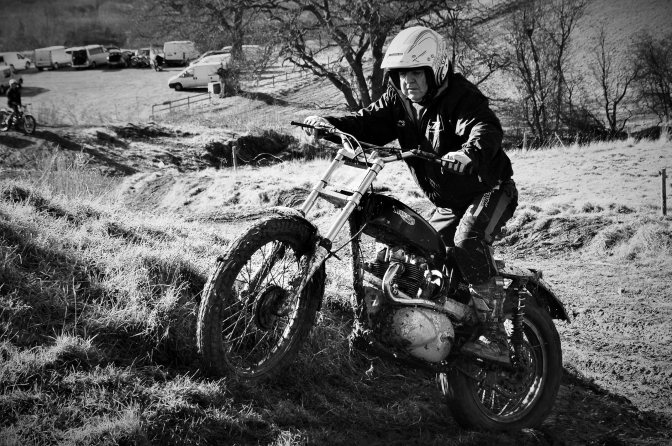 I will finish with this image of a true "British Triumph Machine, it could be mistaken for an ex works machine like Roy Peplow used to ride by the way it has been built, "Great-job" name of rider Pete Reed . 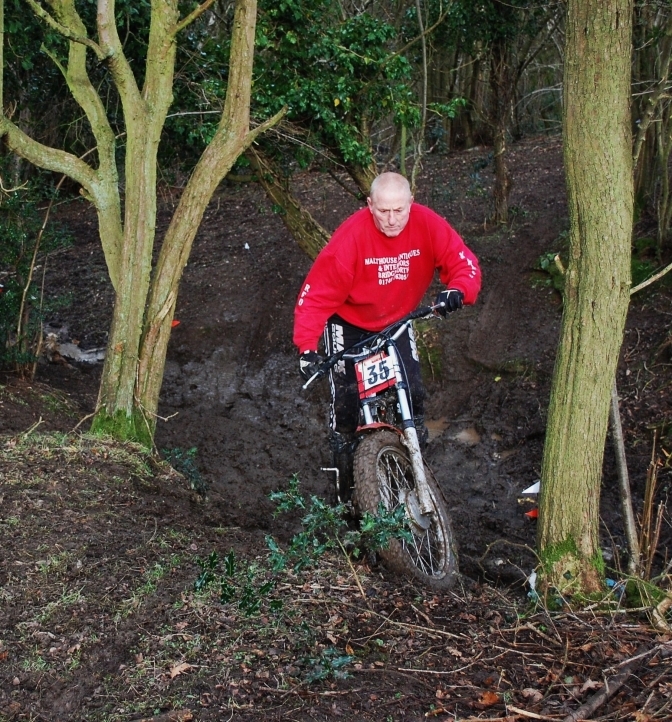 I have loads more images, that I will use on other Bike specific pages but I will let you know where they are. I also have the use when sent me of the 100 plus shots that Lee snapped as well you can see him in the background of the first photo. There you go, Lee Prescott Sports Photographer. 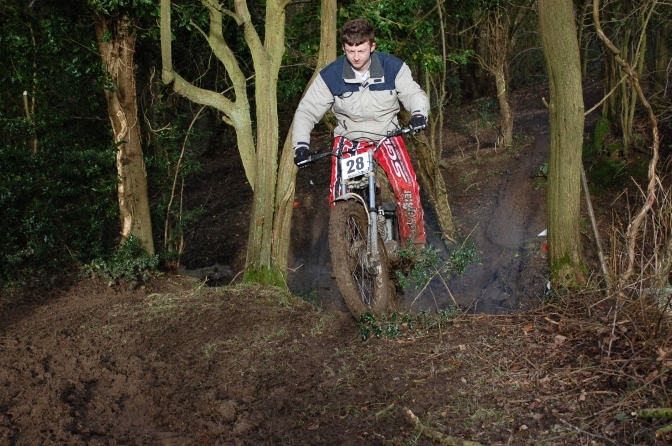 and Intermediate Class Winner Joe Owen. Photo Courtesy and copyright Lee Prescott. 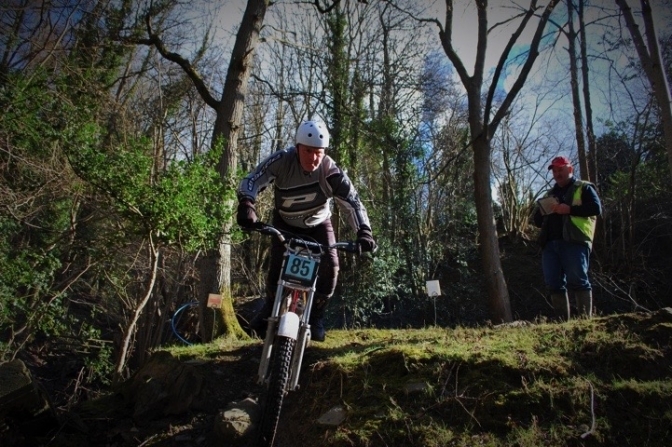 Rider Andy Briggs. 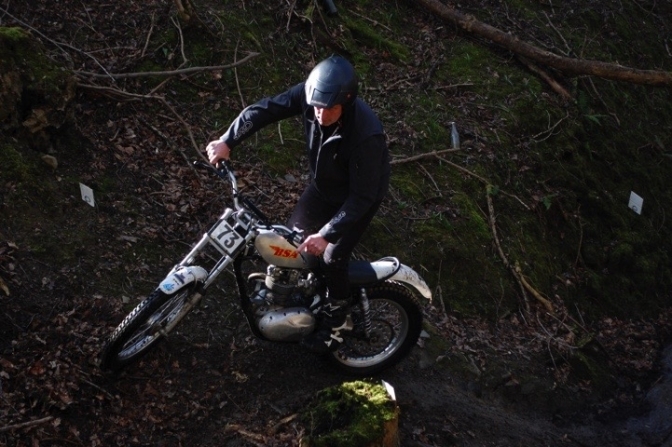 Here's a better shot of Joe Owen "Intermediate Winner" riding his Triumph Twin. The Growl of the twin Triumphs is music to your ears. 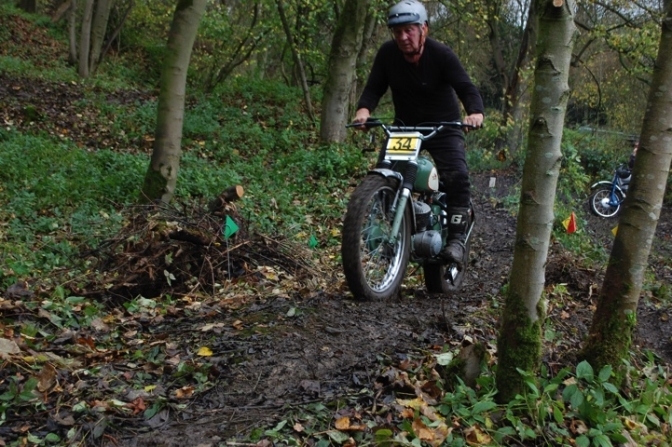 Just one last shot of Kevin Walker Triumph Cub. This is just a start to this page until I am sent more, photos. I will get to Ullenhall if I can. to take some.,Done That!! 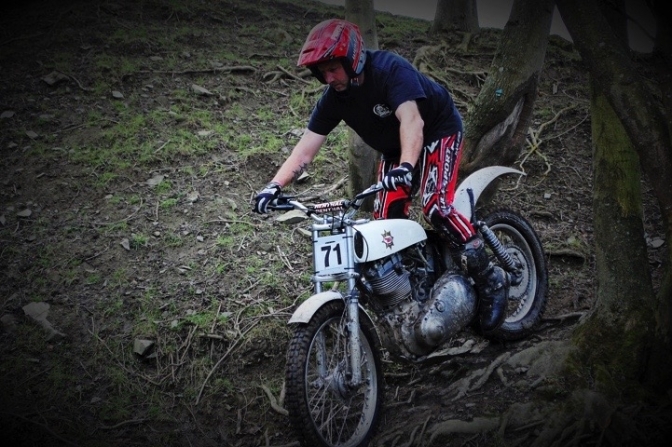 Bob Greenhough BSA Bantam takes a run at the climb. 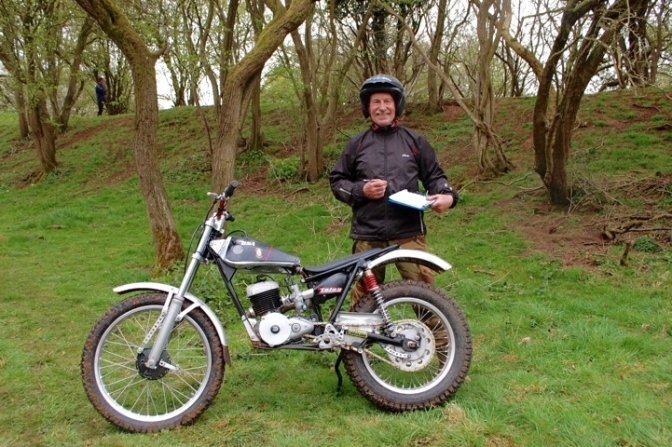 Steve Haines Triumph Cub. showing some style. Arthur Browning Jawa in a tight spot. One for the Greeves Page me thinks. Mike Butler. And one for the D.O.T. page First time out for this Newcomer to the Classic scene.Andy Crabb. Report by Joe Owen now on the BMCA website. 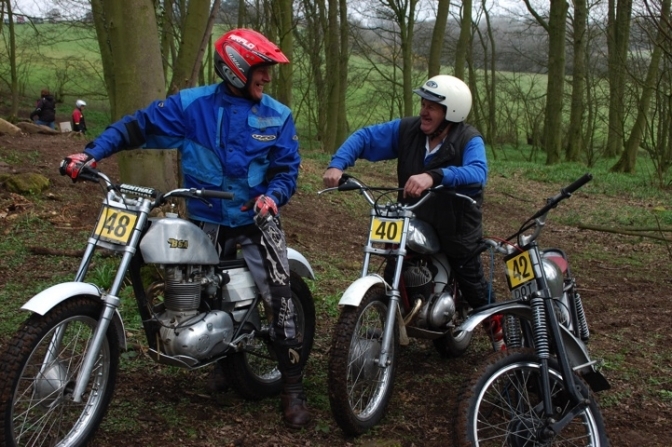 Here Andy Hunt and John Jackson talk over the days events. 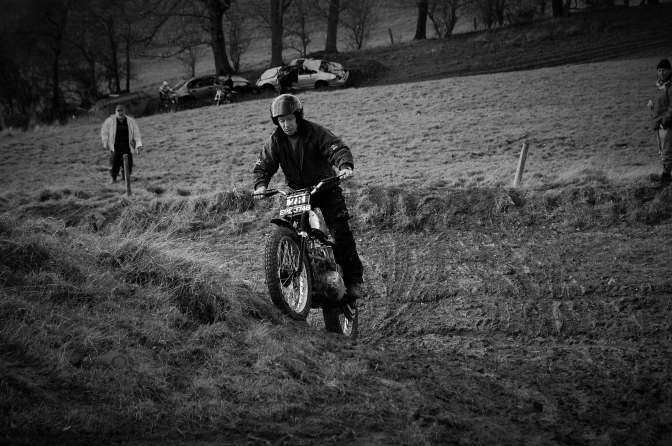 Local enthusiasts and riders John Davies and Nigel Houlston had spent a lot of time during the week setting-out the hazards and had deliberately kept the sections wide to give a choice of lines... Interestingly many riders failed to notice or take advantage of this... For those who appreciate a lovely old machine in it's natural habitat, it was well worth keeping an eye on Dave Beddoes on his 1932 OK-Supreme fitted with a J.A. Prestwich engine. 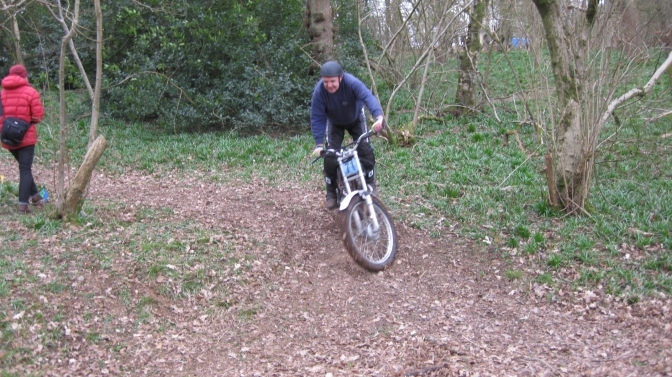 Comparatively lightweight, this girder fork rigid 250cc bicycle coped remarkably well with the conditions. 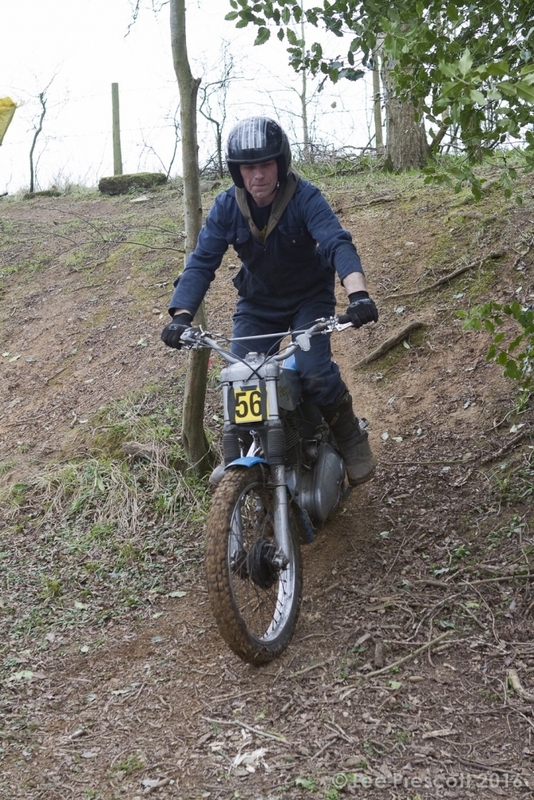 Beddoes first admitted that maybe he should have brought his Bantam, but nearing the end of the trial was revelling in the delight of bringing the Birmingham OK-Supreme back in one piece! 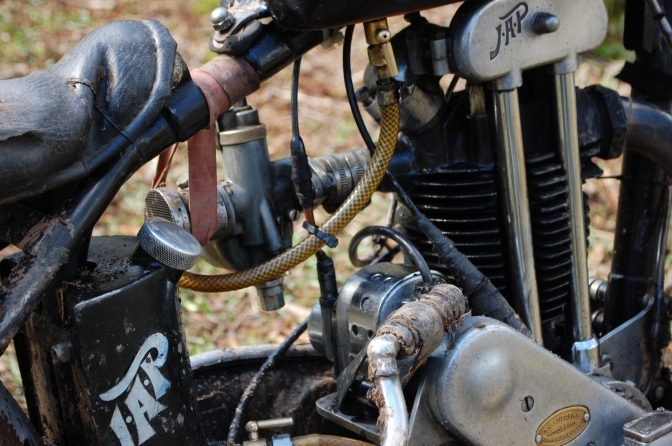 The rubber hose carburettor inlet pipe allowed the instrument to sag downwards on one memorable occasion, pulling the throttle cable and slide suddenly to full chat... but nothing that couldn't be fixed with a good old rubber inner tube band! The observers, including former solo grass-tracker Nic Aldridge, had a fair bit of trudging up the hill to reach their sections, but the weather held fine, despite all four seasons in one on the Saturday, and retirements were notably few and all in all a very successful trial and probably some stiff limbs on Monday morning. 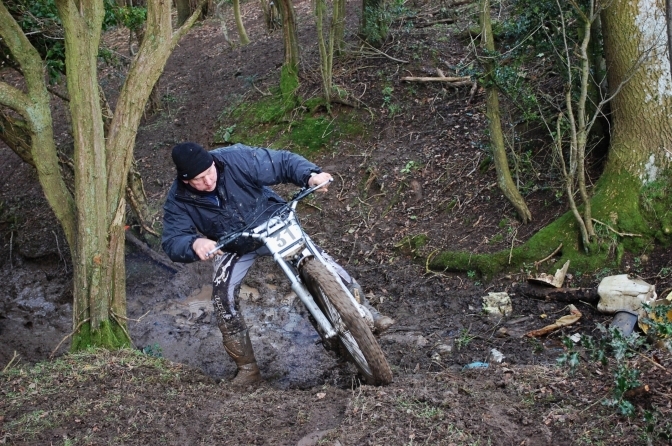 But back for more next weekend, when the quest to find the "grip" continues... "Hammertight". Dave Beddoes 1932 OK Supreme. Looking Good. The Old Fixes are the best that's if you could still get Red Rubber car inner-tubes. Steve Hay in form again. Nigel Randall on the "Edge". Clubman Winner. 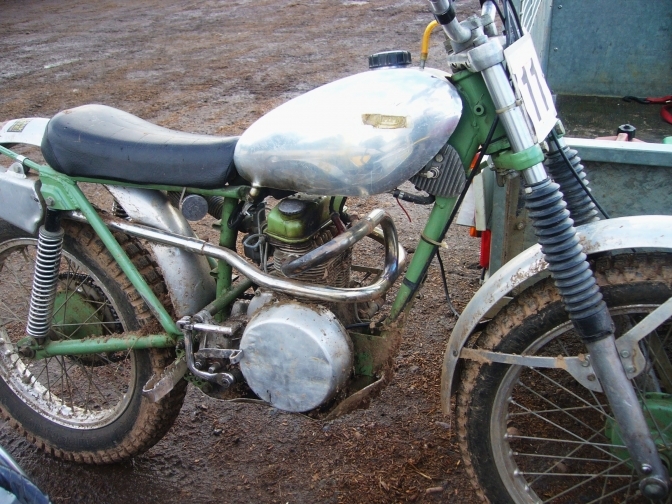 Bill Woodcock BSA Bantam. 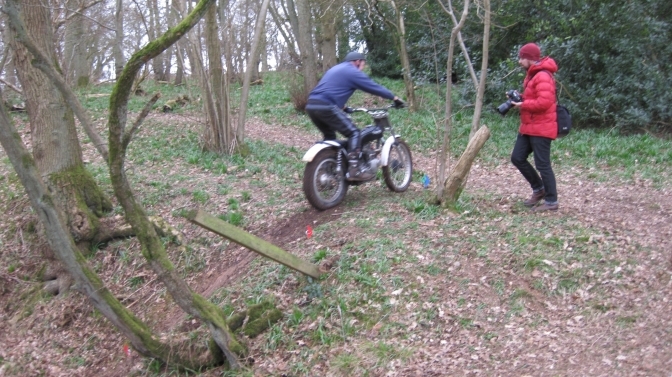 The other Photos from this trial taken by "Hammertight" are on the "Mike Mills" "Legend" page, and the D.O.T. page respectively. 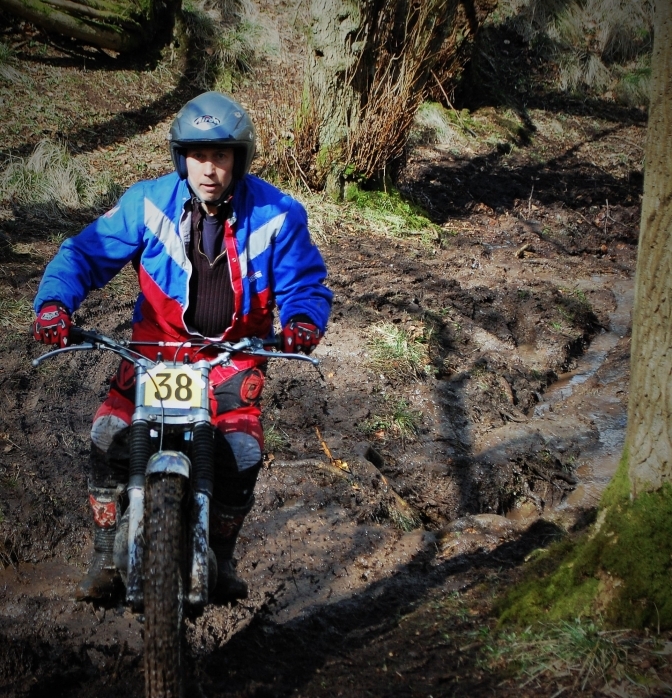 Deryk, Full report is now on BMCA web results pages. Will also send photographs to Charlie for his BMCA page. Photographs: 1546- Graham Greaves - First Drayton Bantam built by Jim Pickering. 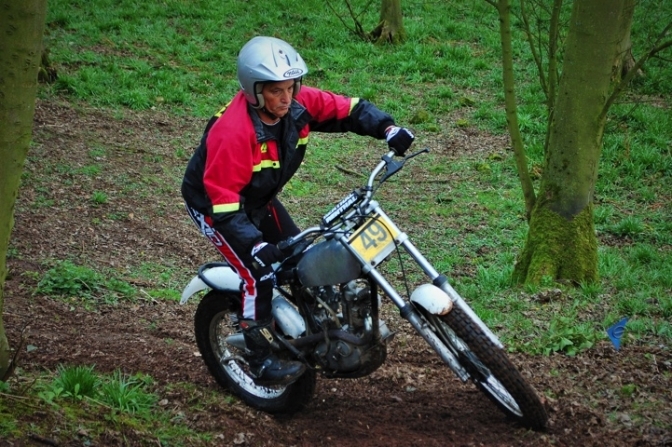 1571- Dave Beddoes - 1932 250cc OK-Supreme with JAP motor. 1572- OK-Supreme with Dave Beddoes cleans section ten on all four visits! 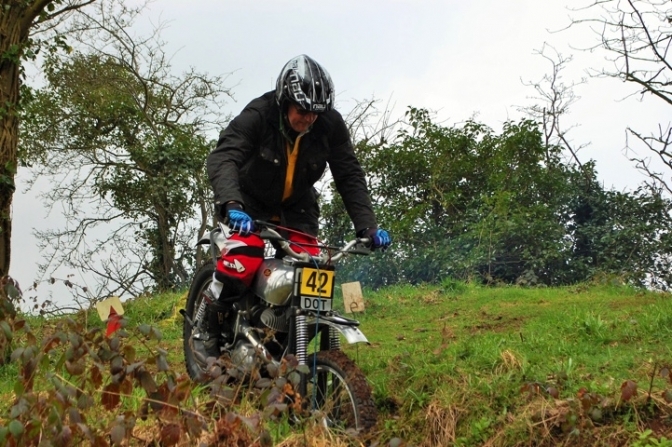 1601- Kevin Hall - Cub. 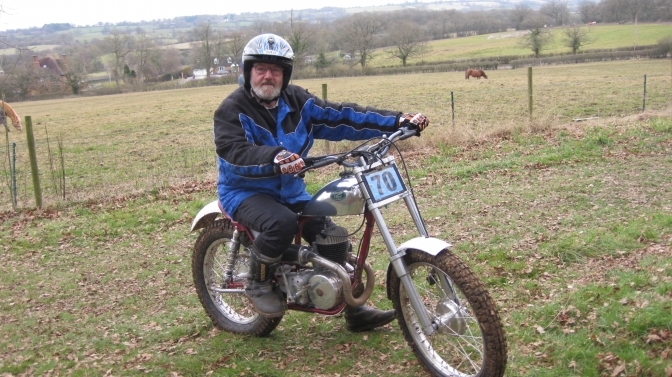 1627- John Davies -350cc Triumph in Crusader Frame. Built by Mick Parkes, sold to John Davies, sold to Nigel Houlston who rebuilt her, resold to John Davies! 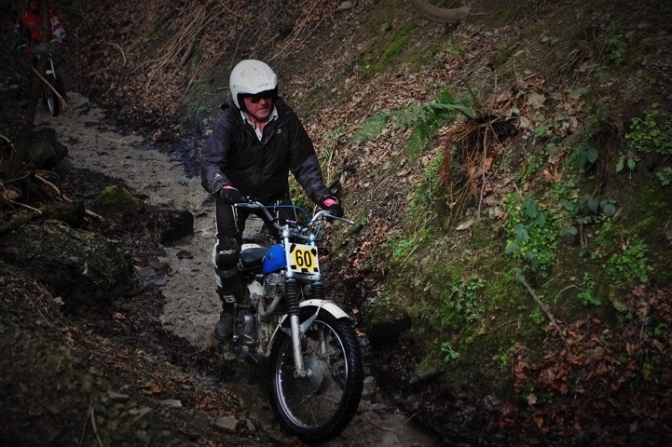 John first competed at Mucklestone in the seventies... Was photographed in ORR on a Greeves successfully getting over a high river step in one of your Welsh events...? 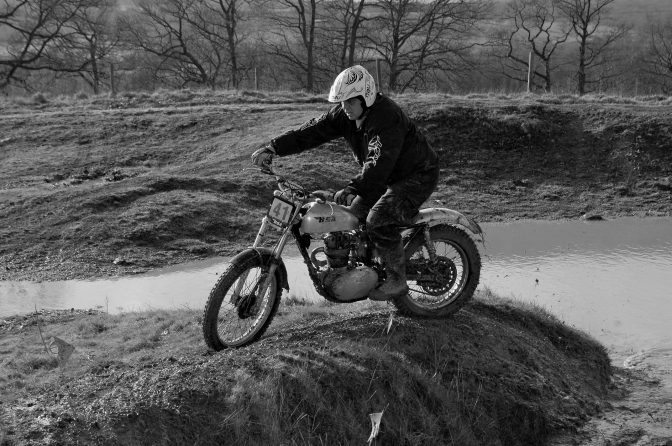 1662- Mick Parkes what he refers to as a "Brit-Shock" based on 1960 Bantam frame, Cub sub frame, Drayton motor, 348 Montesa tank. 1665- Nicklin Greeves is subject to some serious thoughts... by L to R Mick Parkes, Steve Hay, Mike Butler (owner) Jim Pickering and Les Richardson. 1668- Dot rider Geoff and BMCA Observer wife Jean Derricutt and Frank Bourne. 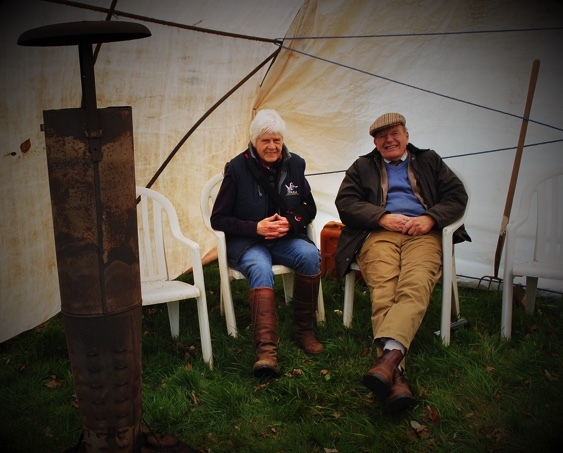 1672- Carol Davis and Frank Bourne - "By the Fireside" - Ancient Salamander oil heater - plenty of heat, noise and flames... could be mistaken for a pulse-jet powered V1 Flying Bomb motor... 1525- Mick Parkes and John Davies discuss how best to pull the wool over the eyes of the hapless observers... 1614- Bill Bourne eases the Triumph up the rock slabs of section nine. 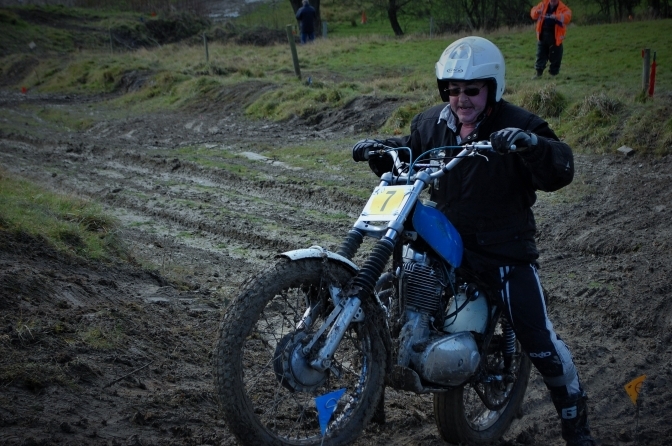 1582- Joe Owen still manages to keep his feet up on section nine after the Triumph suddenly jumped out of gear...! Cheers! Hammertight. All Photos Courtesy "Hammertight" in this section. 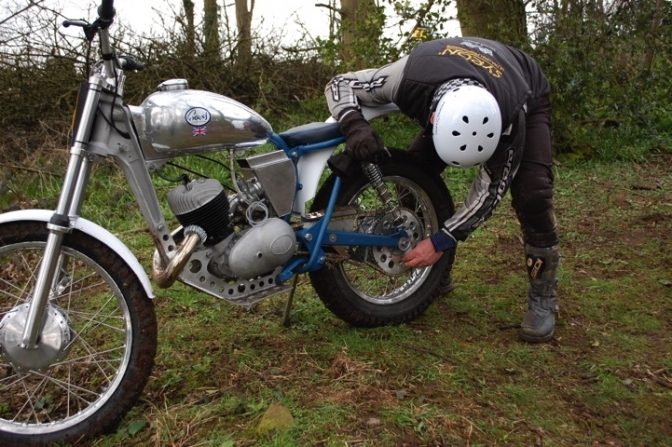 Here The True "Britshock" Drayton engined BSA Bantam of Mick Parkes. A case of not getting enough sleep the night before. I know the feeling! However you build a machine there is always some that will criticize, and shame on a Professional Jim. And then the tale is always twisted when it is passed on. And it is always better talking about it in the warm. The "Salamander" heater ,that's the one you can't get insurance on for love or money, when there hot there hot, and when they bubble and spit, you run for your lives. Are Well. Its always better to pass the subject on to a committee to come up with the right result. At least they always see things in "Black and White". well nearly. And at least see the wood from the trees. There's always one dark area for discussion though. Some are just to old to worry about it. And some just get on with the job in hand. 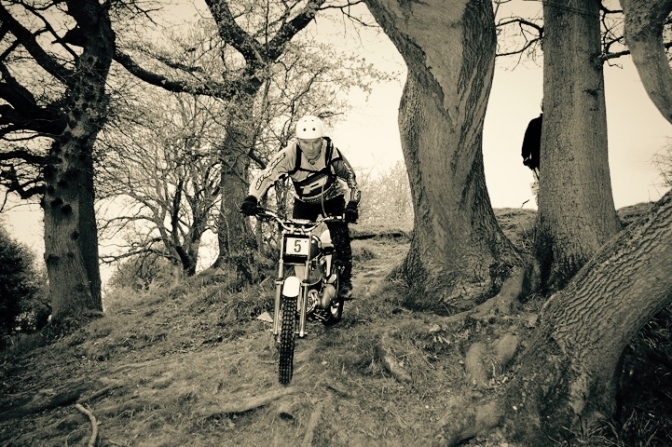 More photos on the Greeves page. and others I will-let you know. Mike Mills page for one.